The 2015 sales figures are in, and e-book sales had their first meaningful decline: from $1.6B in 2014 to $1.4B in 2015. Sales had increased exponentially for a while, then plateaued around $1.5B per year, and this is the first real decrease. Is it a blip or the start of a decline? Note that the AAP no longer gives as much detail on sales (they want you to pay for exact figures), so the totals for the last 2 years are rounded to the nearest hundred million dollars. Just for fun, back in 2013, I predicted a “5–10% increase” for 2014 (actual was +6.7%), so I did pretty well there. I didn’t make a prediction for 2015, but I don’t think I would have expected a decrease of more than 10%. It still marks 5 years in a row of e-book sales of over one billion dollars, and remember this only counts large publisher sales, not self-published e-books, which account for a larger and larger slice of the market. 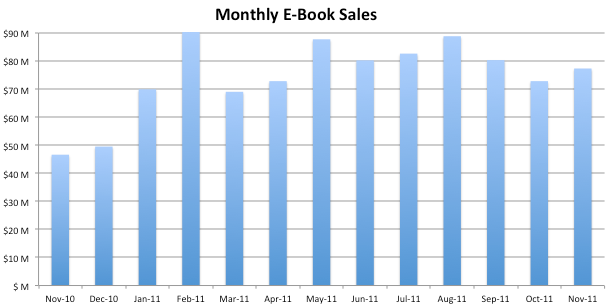 So overall e-book sales may even still be going up. For adult books, e-book sales were down 9.5%, and children’s & young adult e-book sales were down 43.3%. Overall trade book sales were $7,186.3M in 2015, up slightly from $7,128.7M in 2014. That would put e-books at about 19.5% of the total. 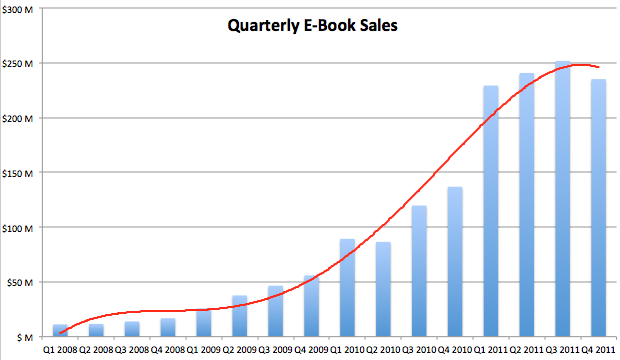 Year-end 2013 book sales numbers are in, and e-books essentially flatlined from 2012 figures, coming in at $1,534M. The slowdown was expected, especially since 2012 was considered a great year due to the success of 50 Shades of Grey and The Hunger Games. Adult e-book sales were actually up 3.8%, to $1,300.9M. Children’s e-book sales decreased a whopping -26.7% (remember The Hunger Games), while religious e-books increased 9.7%, to $63.6M. Overall book sales came in at $7,013.3M, down almost 1% from 2012. Adult e-book sales actually encompassed 26.7% of the market (up from 23% in 2012). Overall, e-books accounted for 21.9% of all book revenue, slightly behind last year’s pace, since children’s e-book sales were down significantly. So how did I do on my yearly prediction? After hitting the target pretty much spot-on (within 3%!) in both 2012 and 2011, I was farther off this year. I did expect e-book sales to slow significantly (I predicted a 20-25% increase, compared to triple-digit increases in the past), but sales ended up essentially flat. As I said, between work and a kid, I have had far less time to keep up with the publishing industry, and I guess it showed. Also, due to the aforementioned constraints on my time, my personal reading has dropped to almost zero… so I partially blame myself for the slowdown in e-book sales! Print books did better than expected, but still declined slightly, from about $5,338M to about $5,289M. Buoyed by the growth in e-books, overall publisher revenues increased 6.2%, from about $6,431M to $6,829M. It seems clear that the days of e-book sales doubling and tripling are over, based on these 2012 figures, the fact that December sales grew even slower than overall 2012 sales (up only 20% from Dec 2011), and the fact that nothing can double or triple forever, especially as a percentage of overall sales. Of course, nothing can double forever, and my early prediction is that 2012 e-book sales will fail to double from this year’s numbers — maybe up 50% or so to about $1,500M (one and a half billion). Note: between an all-encompassing “day job” and the arrival of our first child last month, I haven’t had nearly enough time to keep up with publishing industry trends or e-book sales stats as I used to — let alone having time to then blog about those things. But I’ll go ahead and keep up the tradition and make a prediction for 2013 e-book sales anyway: based on the lack of innovation in e-readers (yes, we have lighted e-readers, but no color or flexible screens yet) and the saturation of the market, I predict that e-book sales will continue to slow their rate of increase, perhaps increasing another 20-25% over this year’s sales figures, which would put 2013 e-book sales between $1.75 and $2 billion. It appears print books had a banner month, pushing total sales to $578.3M, the second-highest month I’ve seen since I’ve been tracking these figures (Oct 2010 clocked in at $609.7M). If those numbers are accurate, it’s the best month for mass-market paperbacks since Sep 2010, which had been in a steady decline. E-Books accounted for 19.9% of the total sales reported above, a decrease from last month, but a little above last year’s average of 19.1%. UPDATE: Religious e-books accounted for $7,600,000, bringing the total to $122.5M for the month. 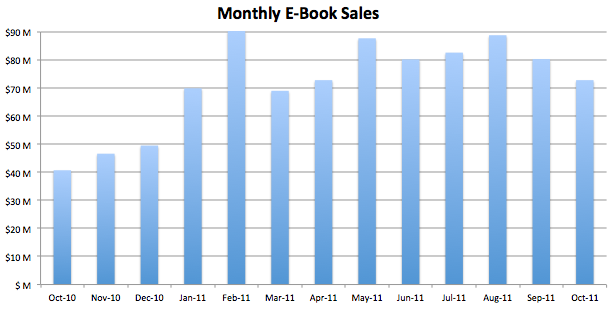 Looks like a big month for e-books in January 2012, although the Association of American Publishers went and changed up their system on us, growing from collecting data from 90 publishers up to 1,150. While this should give a more comprehensive and accurate picture of sales, it also makes comparisons with prior data more difficult. On the plus side, they released a good amount of granular detail for both January 2011 and January 2012. The summary: e-book sales for January 2012 total a whopping $128.8M, shattering the old record of $90.3M from Feb 2011 (more on that next month). 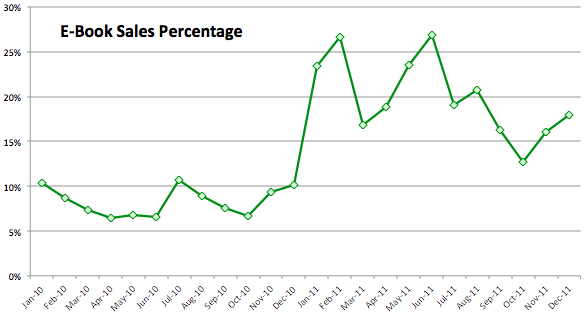 This compares to (revised, apples-to-apples) sales from January 2011 of $73.2M, or a 56.8% increase. Perhaps most impressively, e-books totaled 26.7% of all book sales (print, e-book, and audiobooks) for the month. The AAP must have some other figures they don’t include in the numbers above, because they list total Jan 2012 sales at $503.5M and Jan 2011 at $396.0M, a healthy 27.1% increase from last year. Mass-market paperback sales continue their decline (now down below 1/3rd that of e-books — it wasn’t that long ago that e-books passing MM paperbacks seemed like a big deal). Adult e-book sales are up almost 50% from last year, and young adult e-book sales are up nearly six times last year’s figures, due no doubt to the increasing popularity of color tablets (like the Kindle Fire and Nook Tablet) that allow for interactive children’s e-books. Young adult sales in general did very well — I wonder if much of the difference can be attributed to the mega-popular Hunger Games books. As explained above, don’t look at this chart and take the comparisons to earlier months as gospel, as the AAP’s new methodology makes month-to-month comparisons inexact. Last year, Jan 2011 sales were reported as $69.9M; this month (retroactively using the new methodology), they were adjusted upward to $73.2M. But a total of $128.8M in e-book sales is still a significant increase from any previous months, putting e-books on pace for $1.5 billion in sales for the year. The good news is that the prices are fairly reasonable, ranging from $7.99 (for each of the first three books) to $9.99 (for each of the remaining four). This fills an important gap in the e-book world, and was probably the reason that a sizable chunk of people was holding off on buying Kindles or other e-readers. I have no doubt that this announcement alone will result in a noticeable bump in Kindle device sales. I would expect it to especially impact younger readers, who are now more likely than ever to start reading e-books. In any event, I’m sure these e-books will do quite well (better late than never), and this announcement will make many of her fans quite happy. 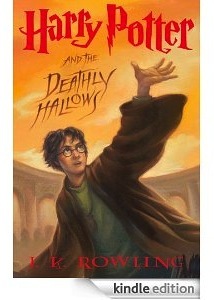 Welcome to 2012, J.K. Rowling! With December’s figures, the total sales for 2011 are in the books, and e-book sales increased 117% (more than double) from 2010, totaling $969.9M for the year. (As usual, note that the total figure is slightly higher than adding up the previous 12 months above, as the numbers usually are adjusted slightly upward for late-reporting sales.) This came in pretty close to, but just under, my prediction of $1 billion in e-book sales for the year (I was off by 3%). As you can see from the chart above, Q4 2011 took a surprising dip from the previous two quarters for the first time in several years. 2011 was not a great year for print book sales, with all 5 categories of print book sales down from the year before, with mass-market paperbacks predictably getting hammered the hardest, as they are the most likely to be replaced by e-book sales. 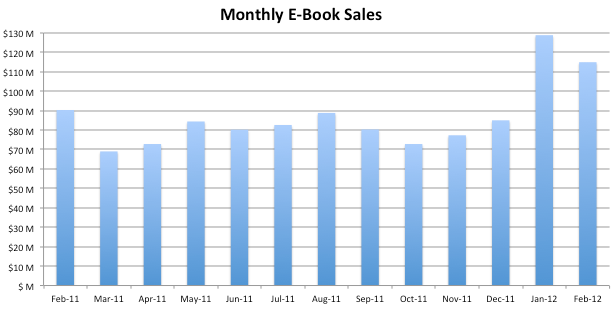 So, overall, another year of e-book sales more than doubling. However, the slowdown in the last quarter and overall leveling off of sales in 2011 might hint that we’re heading for a plateau, or at least a tapering of e-book sales growth. Of course, nothing can double forever, and my early prediction is that 2012 e-book sales will fail to double from this year’s numbers — maybe up 50% or so to about $1,500M (one and a half billion). I think we’ll see a continued decline in print books, leading to e-books garnering roughly one-third of the overall book market this year. But I think we might be a couple years away from breaching 50% — which might require a technological advance like color e-Ink or foldable screens, or a game-changing event in the publishing world, such as superstar authors going independent and straight to e-books, big publishers embracing e-books, or lowering of e-book pricing (perhaps as a result of the agency model going away). In any case, I’m sure 2012 will be another interesting year for the publishing industry in general, and for e-books in particular. Google Books Actually Selling E-Books — Who Knew? You may notice that, when I discuss the e-book publishing landscape on this blog, I’ll often talk about Amazon, and Barnes & Noble, and to a lesser extent Kobo, Apple, Smashwords, and even Sony. I’ve sold multiple e-books through all of those channels (in decreasing amounts in the order listed) — in quintuple digits (Amazon), quadruple digits (B&N), triple digits (Kobo), or double digits (the rest). But, even though I’ve listed my books with Google (confusingly named Google Books, the Google Partner Program, Google Editions, and Google E-Books at various times) since they began back in 2010, I had yet to see one single, solitary e-book sale from them. As I predicted back then, it didn’t seem like Google had its act together in the e-book selling game (step one: pick a name) and they were pretty late out of the gate, compared to Amazon (which launched the Kindle Store in 2007) or Sony before that. Well, I can admit when I’m wrong, and I’m pleased to announce that I just learned that I sold my first-ever e-book on Google. While it has a long way to go to catch some of the other sales channels, maybe it’s the start of something big. So I’d like to offer a hearty thank-you to my first Google E-Book reader — if you’re from Australia, and bought Declination through Google on February 9, step forward and claim your prize! Of course, I had stopped checking sales through Google (fellow authors will understand the urge to check book sales on an hourly or even by-the-minute basis and understand what it means to not check for months), and only learned of last month’s sale by seeing the payment when I checked my bank statement. Anyway, there you have it, Google is officially selling e-books (or should I say “e-book”?) and even paying royalties. My questions to my readers are: Have any of you bought any e-books from Google? Have any authors reading this sold any e-books through Google? And a final question: How can Google be so good at search and maps and VOIP phone service, and so terrible at other things? e-books Comments Off on Google Books Actually Selling E-Books — Who Knew? November e-book sales increased slightly from October, to $77.3M, but continued the meandering range that may signal a plateau, or at least a noticeable slowing, of the heretofore-explosive growth of e-book sales. While sales were still up 65.9% from November 2010, that rate marks the slowest increase of the year (and last month’s 81.2% growth rate clocks in as the second-slowest of 2011). 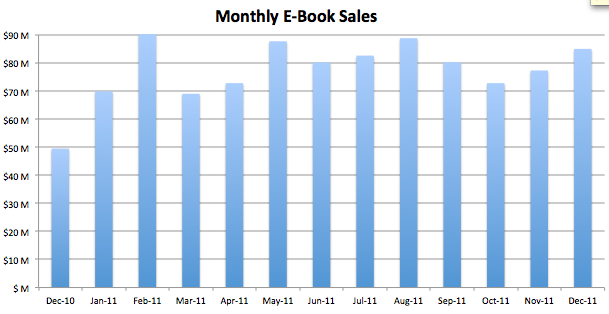 Various observers have attributed the slowdown in e-book sales growth to customers waiting until the holiday season to buy new e-readers (note that the Kindle 4 and Kindle Fire were announced September 28, 2011 but didn’t ship until November 21), or to Amazon’s inclusion of Kindle e-books in library lending programs, which began in late September. At an 11-month total of $871.7M (or $885M or so with the more recent, slightly upwardly revised numbers), it would take a great December to hit the $1 billion mark for e-books that I predicted at the start of the year — but they will probably get pretty darn close. One other interesting note: the Publisher’s Weekly press release noted that sales of adult mass-market paperbacks “all but died,” coming in at only $20.8M, less than half the figure from the previous year. This is not too surprising, since the growth of e-books is most likely to impact sales of mass-market paperbacks, as MMPs are the least expensive print offering, their release is delayed after hardcovers (as some publishers do with e-books), and most closely filled the role that e-books are starting to fill for people: day-to-day fiction reading, as opposed to hardcover cookbooks, graphic books, or bookshelf display items. 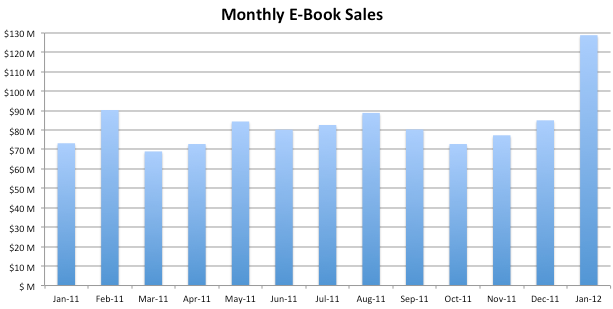 While up 81.2% over October 2010, e-book sales came in at a slightly disappointing $72.8M in October 2011. Publisher’s Weekly reports the total for the first 10 months of 2011 at $807.7M, up 131.1% from the same months in 2010. However, they do point out that October is the first month in 2011 that e-book sales (up only 81.2%) did not double from the previous year. This is the second month in a row that e-books have slowed their pace. In fact, the entire year of 2011 has been fairly steady (compare January 2011’s $69.9M with October’s $72.8M). In fact, the average monthly sales so far in 2010 were $79.4M ($80.8M if you use PW’s updated totals), so October is a below-average month for the year. We’ll see if the holiday shopping season (which has traditionally caused a nice surge as people get e-readers for Xmas) bumps those figures up in December 2011 and January 2012. On a personal note, I apologize for the lack of regular posts — my job has been taking up all of my time, and I just haven’t had the time I’d like to devote to blogging (let alone novel-writing! ).